22 October 2015: “The Arcola Theatre in Dalston is a step closer to becoming the world’s ﬁrst carbon-neutral theatre after it won funding for a new heating system”. Full story on Arcola’s plans to use a “biomass boiler, which generates heat from waste and scrap wood that would otherwise go to landﬁll”, following their recent funding award from Marks & Spencer’s Community Energy Fund, in the Hackney Citizen. July 2013: Deborah Collins, Strategic Director of Environment and Leisure of Southwark Council provided a useful update of the Southwark Heat Network project at the recent BASELondon show. 1,200 Southwark properties will benefit from the district heating network, which will be fed from currently wasted heat from the SELCHP waste to energy plant, based in neighbouring Lewisham. Work has been ongoing on installing the heat mains for the scheme and it is anticipated that this month will see the completion of all remaining pipes being installed and final boiler room modifications. Testing and calibration of the scheme will run over August and September with October being the target month for heat delivery to residents. Further information can be viewed on the following presentation. Southwark will also see further decentralised energy systems in the borough, with CHP and PV systems being installed on the new Elephant and Castle leisure centre and also biomass and PV used in Camberwell at the new Sacred Heart school development. June 2013: News reports provide an update on progress being made by developer Kedco of their 12MW biomass heat and power plant planned in Enfield. The article states that “Kedco plc, the renewable energy developer and operator focusing on the production of clean energy in the UK and Ireland, is pleased to announce the appointment of the Foresight Group (“Foresight”) as the preferred funding partner in relation to its 12 MW Enfield Biomass CHP project located in North London. Kedco has signed a non-binding heads of terms with Foresight for the provision of debt and equity facilities which will part finance the construction and operation of the Project.” See previous posts here for detail on the scheme. Unusually for such developments, the Renaissance scheme will not only supply heating to the whole of the Renaissance (including the leisure centre and also the London City Mission) but the “the energy centre will also supply electricity to the homes in the block above, as well as to the leisure centre. Excess electricity generated within the energy centre is exported to the National Grid, and the revenue generated offsets the cost of producing heat.” This is a really interesting move – that is the sale of the electricity to onsite customers – by the developer Barratts, and needs to be studied to see how things progress. Much more on efforts being undertaken to help secure the sustainable energy credentials of this project here – and also some further detail in an early Mayoral planning report on the project [see para 99 onwards]. 19 March 2013: Updates from developer Kedco of the biomass combined heat and power (CHP) plant being developed in Enfield (see previous post here for a lot more detail on the scheme). The Telegraph reports that “The project, which has full planning and environmental permission for the conversion of 60,000 tonnes of waste timber per annum into up to 12MW of electricity and heat, remains on track to reach financial close and start construction in the third quarter of 2013. Chief executive Gerry Madden said: “The company has a clear plan in place for the Enfield Biomass CHP project with the key objective being to reach financial close by Q3 2013. Further information on a press report here. 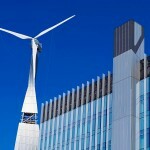 29 May 2012: Sky have announced that they have installed a wind turbine at its West London campus. 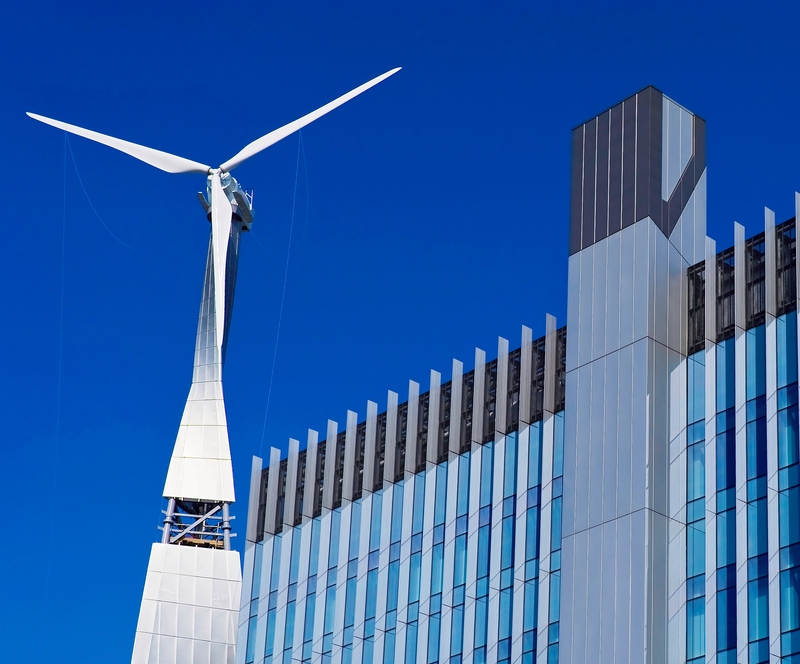 “The 55-metre Northwind 100 turbine is expected to provide over 133 MWh/year of clean energy to Sky Studios – enough to meet its annual office lighting requirements. The new wind turbine will operate in conjunction with Sky’s recently-commissioned [biomass] Combined Cooling, Heating and Power (CCHP) plant.” Read the full news release here. March 2012: The Mayor has just published the latest London Plan Annual Monitoring Report (AMR), which monitors a number of key performance indicators (KPIs) set in London’s spatial strategy, the London Plan. This is the first AMR to be published since the new London Plan was published in July 2011. The total output for 2010 of 858 GWh highlights that London has considerable way to go – a ten-fold increase – to achieve the 2026 target. DECC also produce regional renewable energy statistics – but only report on renewable electricity output (which is hard to compare to that reported above, as the largest GWh component in the table – for biomass – has added the heat and power output components together). 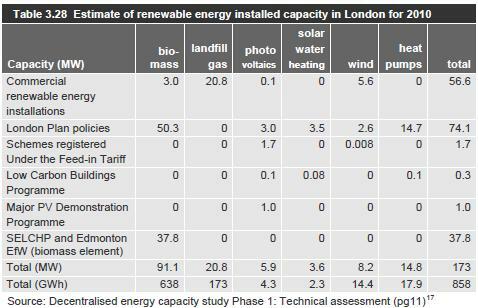 Additional monitoring of the London Plan’s carbon and energy policies are reported here. 25 January 2012: An update has been provided on – as this news release says – is the UK’s first biomass district heating scheme. Hale Village in Tottenham, London, comprises 2220 homes, which will receive heat and hot water via a biomass boiler district heating network using wood pellets. Read more here.